Springsteen first fell in love with rock ‘n’ roll when he saw Elvis Presley perform on The Ed Sullivan Show. “Elvis was as big as the whole country itself,” Springsteen later remembered, “as big as the whole dream. He just embodied the essence of it and he was in mortal combat with the thing. Nothing will ever take the place of that guy.” Springsteen’s mother took out a loan to buy him a $60 Kent guitar for his 16th birthday, and he hasn’t stopped playing the instrument since then. 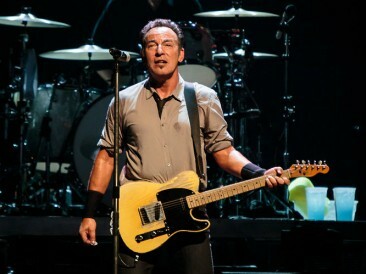 By the late 1960s, Springsteen was spending most of his time in Asbury Park on the New Jersey Shore, playing in several different bands while he forged his unique sound and introduced audiences to the gravelly baritone voice for which he would later become famous. 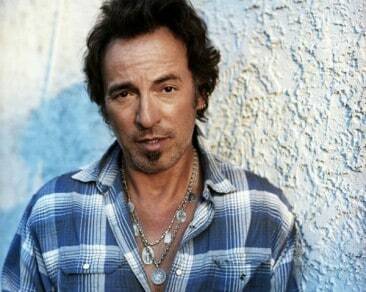 It was there that he first met the musicians who would later form his “E Street Band”. 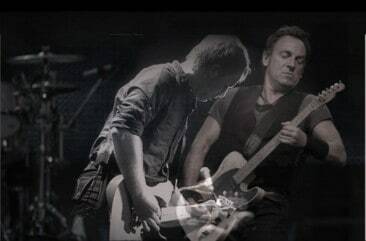 Around this time, Springsteen also acquired his nickname, “The Boss,” because he had a habit of collecting money earned during shows and then distributing it evenly among his band mates. After signing with Columbia Records, Springsteen released his first studio album in 1972. Greetings from Asbury Park, N.J. garnered critical acclaim but slow sales. Many compared him to Bob Dylan for his introspective lyrics and poetic style, but this did not immediately help Springsteen make it big. Finally, in 1975, after over a year in the studio, Springsteen released a third album, “Born to Run”, which peaked at No. 3 on the Billboard 200 and skyrocketed him to fame. Drawing heavily on Springsteen’s New Jersey roots, the album offered soaring guitars, larger-than-life characters, urban romance and a rebellious spirit that captured the essence of the American Dream and connected with audiences of all ages. George Mileson, a musician of American descent, was born in Barcelona on September 26, 1975, if he had been born three days earlier, he would have shared a birthday with his idol Bruce Springsteen. As a child George tried his luck with basketball and baseball, but at 12, after seeing Springsteen in the Camp Nou on the Amnesty International tour, he knew he could not be anything but a musician. 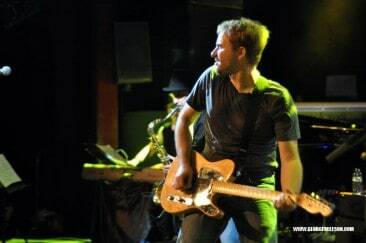 After developing as a multi-instrumentalist, specializing in sound engineering and participating in various musical projects, he created his own company “RoadTrip Records” in 2000, and later released his first album “One”, which already showed clear ‘Springsteen’ influences. The album was launched in Barcelona in December 2005 at the famous “Luz de Gas” concert hall to great acclaim. In 2008 he started working on his second album, “Back To The Road” that was released in January the following year. Following the release of this second album George’s concerts became an eclectic mix of his own songs (influenced by Bruce Springsteen), and many from “The Boss” himself. Whether playing with his band, or when performing solo acoustic concerts, George Mileson brings the “Best of the Boss” to his show and to the audience. One of America’s most iconic performers, Bruce Springsteen has been rockin’ the world for over 30 years with songs like ‘Born in the USA’, ‘Philadelphia’, ‘Badlands’, ‘Thunder Road’ and of course ‘Born to run’. These and many more of the best known and well-loved songs of “The Boss” can be heard during the second concert of Big M Promotions “Hot Summer Nights” season. 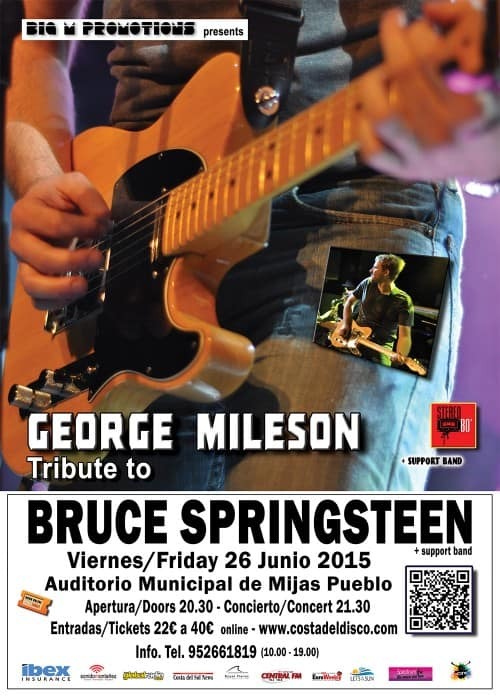 This open air concert features Spain’s top “Bruce Springsteen” tribute band. 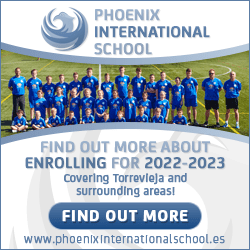 Lead by George Mileson, this 9 piece band has been filling concert venues throughout Spain for many years, and this will be the first performance with full band in Malaga province. George and the band play an average of 25 of Bruce’s songs during a 2 hour performance making this something of a “Brucefest”! 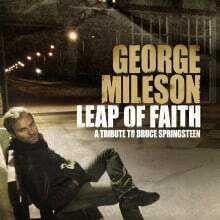 George Mileson’s show is recommended by the Bruce Springsteen fan club, and George has been invited each of the last three years to perform at the legendary “Light of Day Festival” in Asbury Park New Jersey, USA. Opening the night are the talented rock band “Stereo 80” who are masters of 80s rock playing hits from Dire Straits, Queen, A-Ha, Van Halen, Bon Jovi, Guns ‘n Roses, Kiss, AC-DC and many more. For those who like to make the most of a festival atmosphere there will be an American style “Hog Roast”, refreshing Mojitos and of course ice cold beer!! Doors open at 8.30pm and the concert starts at 9.30pm.